Quanser Engineering Blog - Your Comments Welcomed! : Doing Control with LabVIEW - Register for the Webinar! 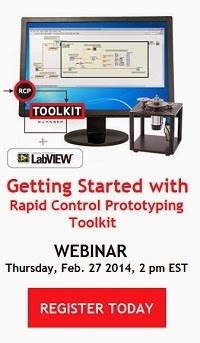 Doing Control with LabVIEW - Register for the Webinar! LabVIEW graphical development environment is widely used in engineering education and research for control systems. With the Quanser Rapid Control Prototyping (RCP) Toolkit for LabVIEW, you can simplify and accelerate your control design process in areas from introductory control topics to advanced algorithms. Register today - the spots are limited!